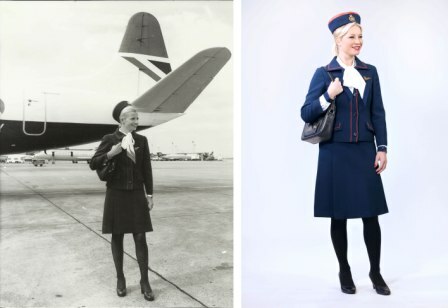 An unlikely couple, but both Denise Van Outen and British Airways share a 40th birthday this month and are celebrating the milestone with Denise van Outen modelling a vintage Hardy Amies 1974 air hostess uniform. The airline, which charts its history back to 1919, became British Airways in April 1974 following the merger of BOAC (British Overseas Airways) and BEA (British European Airways). Denise Van Outen, said: “Forty is no longer seen as a scary age and I’m looking forward to celebrating my milestone birthday in a few weeks. The airline has searched its archives to release past, present and possibly future uniforms to coincide with its ruby anniversary. 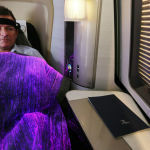 They include the first uniform from 1922 on Daimler Airways one of British Airways’ predecessors, the Hardy Amies two-piece from the seventies, the current Julien Macdonald uniform, and a sci-fi futuristic concept. British Airways is also celebrating with special ‘Ruby Murray’ curry dishes on board selected flights departing from London and America in World Traveller cabins in April. These include a Chettinad Chicken dish and a Keralan vegetable curry – both served with pilau rice and a side of takha dhal and naan bread. For anyone interested in taking an closer look at the airline’s 95 year history, Paul Jarvis, archivist at the British Airways Heritage Centre has written ‘British Airways: An Illustrated History’, which features historic advertising posters and imagery, which show how attitudes to travel and culture have changed. 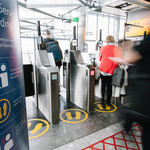 Jarvis comments: “The year 1974 was an important milestone for us, bringing together our short-haul and long-haul operations under the same name and organisation. In 1974 when BOAC, and, BEA, amalgamated as British Airways, it had more than 200 aircraft. Today, British Airways has a fleet of more than 280 and flies to nearly 180 destinations around the world. 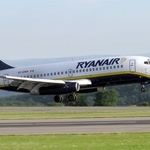 It was voted the Consumer Superbrand in 2014 – the first time an airline has ever been awarded top position.